The calm waters and wooded banks of the untouched Perdido River offer ample opportunity for adventure. This mileage includes the optimal section recommended for paddling. If paddling within the recommended 18 mile portion, this river is a simple, easy going trek. Most trips downstream start at around 4 hours, with lengths extended into two-night overnight adventures. If you're skipping a dunk into the water, this river is an all-season treat! If your pooch is canoe-friendly, the river is pooch friendly! If using Adventures Perdido, fees will apply for rentals and drop offs. These range from $15-$60. Some independent launch points may also require fees, so be sure to bring a few dollars just in case. The Perdido River, with its name translating to “lost,” creates the western Alabama/Florida border with its meandering course through coastal wilderness. Cutting gently through woodland forests of pine and cypress, the Perdido offers ample opportunity for watersports, with canoeing and kayaking at the top of most folks’ lists. The river’s slow, southward decent makes it a perfect destination for beginner paddlers, while overnight adventurers and wildlife junkies alike can relish in sandbars seemingly created for the sole purpose of camping and underdeveloped banks largely devoid of human interruption. Used for lumber transport in previous years, the Perdido River has undergone successful restoration efforts, and the majority of the river remains untamed. Log jams and swift-flowing currents occupy the northern portions of the river, making for questionable conditions, but a large chunk of the river’s lower section just north of Perdido Bay is optimal for paddlers. 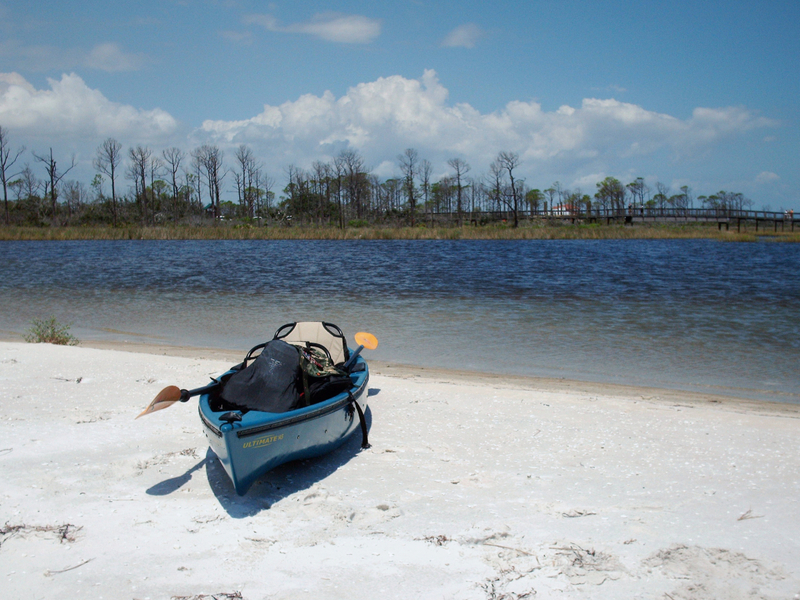 Several entry points, like Filligram Landing, Adventures Perdido River, Barrineau Park, and Sand Landing provide a variety of distances and difficulty levels for kayakers and canoers. Rentals and drop offs are available at Adventures Perdido for those who lack the necessary equipment, or for those with the (understandable) inclination to avoid paddling back upstream to their vehicles. And the paddling itself is arguably a mere vehicle for the sights the river offers---towering pines, the peculiar root system that is cypress knees, and wildlife galore. Bear, deer, and predatory birds can all be spotted along the banks and in the trees of the Perdido River, and few Florida rivers would be complete without the presence of alligators, which---swimmers, beware!---the Perdido does indeed host. If wildlife watching, quiet waters, and impressive stretches of wilderness aren’t enough to convince paddlers to spend a day on this sandy-bottomed river, the promise of largemouth bass, bluegill, and other fish may just reel you in. The Perdido’s quiet nature and largely untouched wilderness appeals to beginner paddlers and patient wildlife enthusiasts. Dense forests provide protective habitats for countless woodland and wetland creatures, and while river-goers are not guaranteed any wildlife experience, the few who stumble upon a bear foraging along the banks, or an alligator slinking into the sun can count themselves lucky. Overnight campers can enjoy the plentiful sandbars and quiet nights; day trippers can make the most of a section of the recommended 18 paddling miles. Whether renting equipment or navigating the rivers in their own vessels, canoers and kayakers should abide by simple regulations all water-bound, outdoor buffs already live by: no glass, pack it in/pack it out, and leave no trace. Respecting the Perdido River is a must if generations to follow wish to continue to enjoy the same paddle trips of today. Adventures Perdido is a short drive from both I-10 and FL HWY 29, while the Barrineau Park, Filligram’s Landing, and Sand Landinglaunch points can be found continuing southward along the path of the river. In short? Be cautious, be respectful, and have fun! Written by Morgan Rice for RootsRated.